TuneIn launches TuneIn Premium subscription service. TuneIn, the world's largest audio network with over 60M monthly active users, today announced a new subscription service - TuneIn Premium. With TuneIn Premium, subscribers will be able to listen to live play-by-play coverage of all Major League Baseball games, Barclays Premier League and Bundesliga matches, over 600 commercial-free music stations, and have unlimited access to over 40,000 audiobooks. 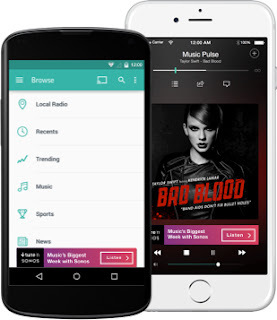 Listeners can subscribe to TuneIn Premium or sign up for a free trial starting today via TuneIn.com and TuneIn's mobile apps for iOS and Android. TuneIn Premium delivers every Major League Baseball game, Unlimited Audiobooks and commercial-free music stations to listeners worldwide. Starting today, TuneIn Premium is available in the US ($7.99 USD/month), Canada ($8.99 CAD/month) and the UK (£5.99/month) with future plans to roll out to additional countries. Users will be able to access TuneIn Premium within the existing TuneIn Radio app, which will remain free and continues to offer over 100,000 streaming radio stations and 5.7 million on-demand programs and podcasts. Major League Baseball: TuneIn Premium subscribers can listen to home and away feeds for every game, from Spring Training to the World Series. All TuneIn users, including those not subscribed to TuneIn Premium, will have access to programs like MLB Fantasy 411, MLB Network Intentional Talk, The Vault, Express Written Consent, and official MLB podcasts. All TuneIn users can follow their favorite MLB teams on team-specific radio stations to hear daily recaps, press conferences, and more. 600 Commercial-Free Music Stations: Partnerships with the largest radio broadcasters around the world make commercial-free radio a reality. Subscribers can listen to over 600 music stations, without commercials. These new stations are programmed by leaders in the industry including Digitally Imported, 977 Music, and JazzRadio.com. Combined, these partners have garnered more than 30 million listening hours in 2015. 40,000+ Audiobooks: Subscribers have unlimited access to a library of more than 40,000 audiobook titles from publishers like Penguin Random House, HarperCollins and Scholastic. Subscribers will also have access to 16 different language learning programs. Barclays Premier League: TuneIn Premium subscribers in the U.S. and Canada have access to over 1,000 play-by-play events per season in English, Spanish, and Mandarin, with select coverage in Malay. Live, play-by-play coverage will be provided every week from talkSPORT. Bundesliga: TuneIn is the only global destination for comprehensive play-by-play coverage of Bundesliga, the best attended soccer league in the world. TuneIn Premium subscribers have access to English commentary for select Bundesliga matches for every time slot (Friday 2:00pm EST, Saturday 9:30am and 12:30pm, Sunday 9:30am and 11:30pm EST) as well as midweek fixtures throughout the season, (over 160 live matches). TuneIn Premium subscribers also have access to live play-by play-coverage for all Bundesliga matches in German. Content from TuneIn's Free Service: TuneIn Premium subscribers can enjoy everything TuneIn's free service has to offer too - 100,000 real radio stations plus more than 5.7 million podcasts from around the world.